Another Calvin character is Tracer Bullet. I think I like him more than Spaceman Spiff, though he makes far fewer appearances. It's Calvin imagining himself in a film noir setting as a private eye. I love his line when he first introduces the character: "I keep two magnums in my desk. One's a gun, and I keep it loaded. The other's a bottle and it keeps me loaded." Just fantastic. 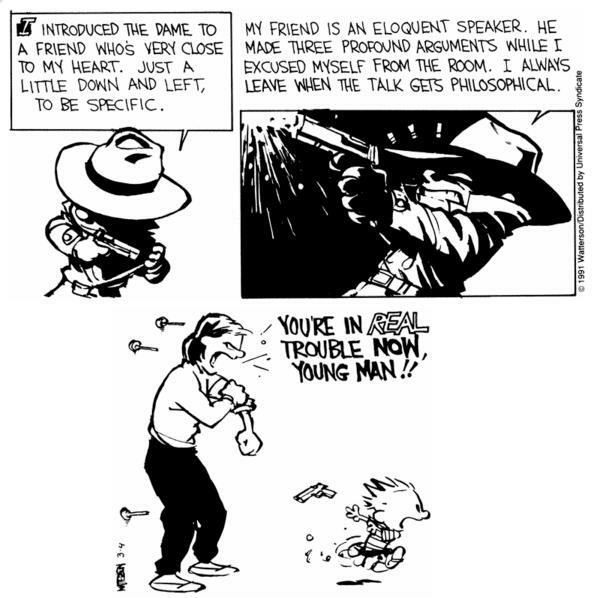 I like this strip because usually when Calvin jumps back to reality, he's still just standing around, "investigating". This is a rare action shot for Tracer Bullet, though I'm sure it's not going to end well for Calvin.